Bowl capacity 6.34 Quarts. Maximum production of 24 quarts of ice cream per hour. Stainless Steel Body and mixing Paddle. AUTOMATIC program and storage. Air cooling. Electronic Speed Control, Inverter. Gravity drain. Gas R404. S/S case and mixing paddle. Gelato Pro 10K CREA is a free standing fully automatic Gelato and ice cream machine easy to operate but powerful. 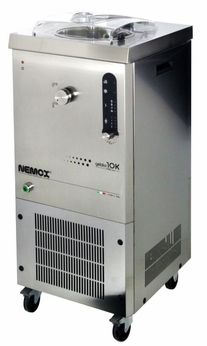 It is suitable for relatively high production of gelato/ice cream and sorbet in a short time. Makes 2.2 kg x Cycle or 11 kg. per hour!  Electrical safety - paddle block on opening of the cover.  Mixing motor induction with thermostat.  Thermic safety for compressor and mixing motor.  Mixing paddle in steel with inserts in technopolimer.  Pump discharge of water for tank cleaning.  Measurements: 41.34" H x 17.72" W x 23.43" D (105 cm H x 45 cm W x 59.5 cm D).  Weight: 148 pounds (67 kilograms).  Material: Stainless steel body, tempered glass unit cover.  Whiping tank capacity: 1.6 gallons (6 liters).  Churning cycle: 12 - 15 minutes.  Max ingredients quantity: 2.5 kilograms.  Production capacity per cycle: 4.85 pounds / 4 quarts (2.2 kilograms / 3.79 liters).  Production capacity per hour: 24.25 pounds / 18.93 quarts (11 kilograms / 21.29 liters).  Belt reduction: 100 rpm. The professional ice cream machine Gelato Pro 10K will be shipped by truck only. The shipping cost will be added to the order amount upon determination.